Mold naturally grows in moist places, and when mold grows undetected, it can create a variety of health issues, along with poor air quality. To better the health of your family and guests, you should know how to prevent mold. Preventing mold is simple if you follow these tips. Moist and wet areas are the perfect breeding ground for mold. Without moisture, mold cannot grow. It is necessary to dry wet items as quickly as possible. If you have leaking pipes or spill water on the carpet, be sure to clean it up within 24 to 48 hours. Leaving water for two days gives mold enough time to start growing. Remember if you experience flooding to throw out any carpet or furniture affected by the water. Proper ventilation is key to preventing mold. Many of your everyday activities enable mold to grow. Things like cooking, doing laundry and taking a shower invites mold growth. Be sure to uninvite mold by having proper ventilation while doing these activities. Decent ventilation should not lead to your attic but outside your home. Any product you use to remove moisture should only remove moisture it should not add moisture to your home. Inadequate airflow can enable mold to grow. To create good air flow through your house, move furniture away from walls, keep closet doors open, and open windows. Doing these things helps air to flow more efficiently through your home. If you have a dark area of your home, be sure there is good air flow since mold like to grow in dark and moist places. There are areas in your home that may be more prone to mold. You cannot make your home mold proof, but you can do identify mold-prone areas and make those areas mold resistant. Assess your home to find areas with more moisture. Making your home mold resistant might be as simple as ripping up wet carpet, installing mold-resistant products, or repairing damaged gutters. Whatever the problem may be, make sure to fix the issue early because it could cost more later on. Leaking pipes cause a wet and moist environment. Having a leaking pipe can cause a mold problem. It is important to replace or fix a leaking pipe before too much water builds up. Once the water has built up, the mold will start to grow, and you will end up paying more money. Fixing leaking pipes not only helps prevent mold but it saves you the headache of dealing with flooding. Even if you follow these tips, you may still experience mold. Once the mold starts to grow in your house, it is hard to get rid of on your own. If you have a mold problem, then it is time to contact the experts. Stop putting your family at risk for health issues, and call the professionals at Kelley Klean. 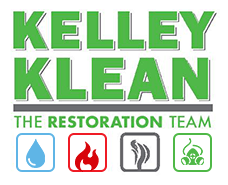 Kelley Klean identifies the mold source and uses top of the line products to rid your home of mold. Don’t wait any longer call Kelley Klean and make sure you prevent mold from growing again.